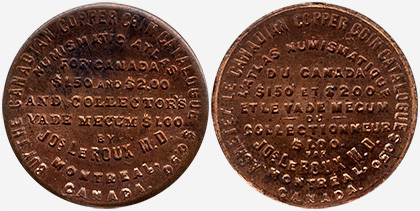 Doctor Joseph Leroux was born at Saint-Augustin, in the County of Two Mountains, Province of Quebec, on the ninth of April, 1849 His father, Dieudonne Leroux, and his mother, Domithilde Allaire, were both French Canadians, and, like most early French Canadians, were so happy in their union that they were blessed with a family of twentytwo children. It cannot be expected that the subject of this sketch received any special attention in his early years, but his parents, knowing the value of a good education, sent young Joseph to school when five years old, and at twelve he was found competent enough to pursue his own way, dependent on his own resources. When nineteen he entered the Jacques Cartier Normal School in Montreal, and there made such rapid progress that in 1871 he was prepared to undertake the head mastership of a country model school. In 1873 he married Miss Marie G. Mitchell, but they did not follow the example of his parents, for only two children have appeared as the fruits of their union. 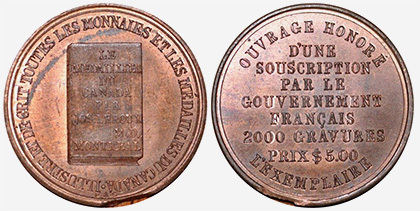 In 1877 the Provincial Government conferred on him an Academy Diploma, and the following year he visited Europe to study the different systems of education prevailing on the continent. In 1879 sickness occasioned his return and his relinquishment of the teaching profession ; he therefore in the same year took up his studies for the profession of medicine at the Laval University, from which he received the degree of Bachelor in 1881 and that of Doctor of Medicine in 1883. 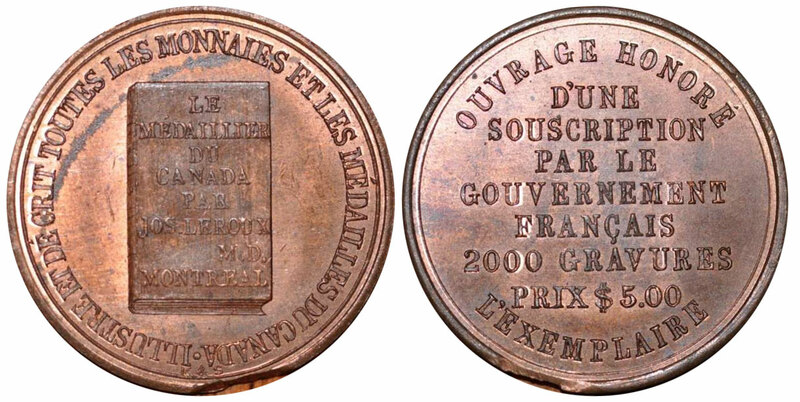 Dr. Leroux commenced to collect in 1876 and entered into numismatic studies with great fervency. 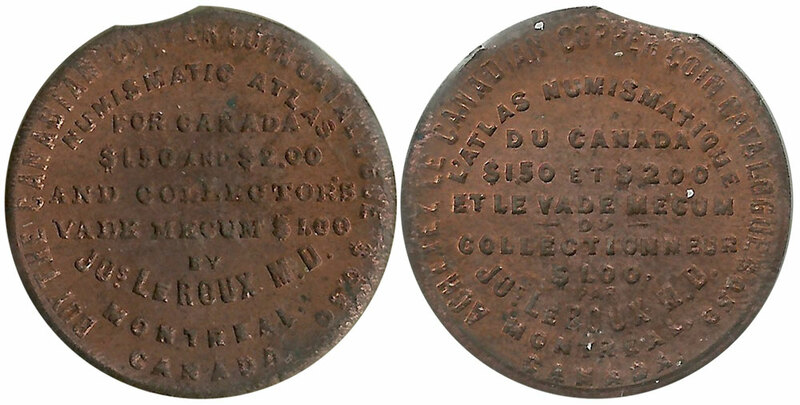 In 1882 he published a catalogue of Canadian coins ; in 1883 his Canadian Numismatic Atlas; in 1885 the Collectors'Vade Mecum, and in 1886 the " Collectionneur," a monthly journal, but his most important work was his Canadian Coin Cabinet, published in 1888, of which a supplement appeared in 1890, and an enlarged and revised edition in 1892. 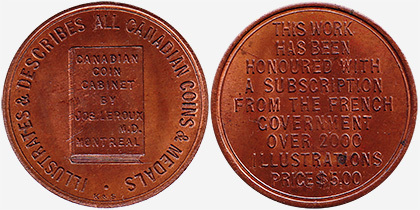 As may thus be seen, Dr. Leroux has earned the thanks of Numismatic Amateurs in making known to them coins and medals by his illustrations, and the importance of collections of this kind. The encouragement that has been so extensively bestowed on his wrorks has only been his due and few writers have had the advantage of the doctor in being thus rewarded by an ample remuneration through the sale of their works. Text : Le m�daillier du Canada par Jos.Leroux M.D. Montr�al - Illustr� et d�crit toutes les monnaies et les m�dailles du Canada - Ouvrage honor� d'une souscription par le gouvernement fran�ais 2000 gravures prix $ 5.00 l'exemplaire.